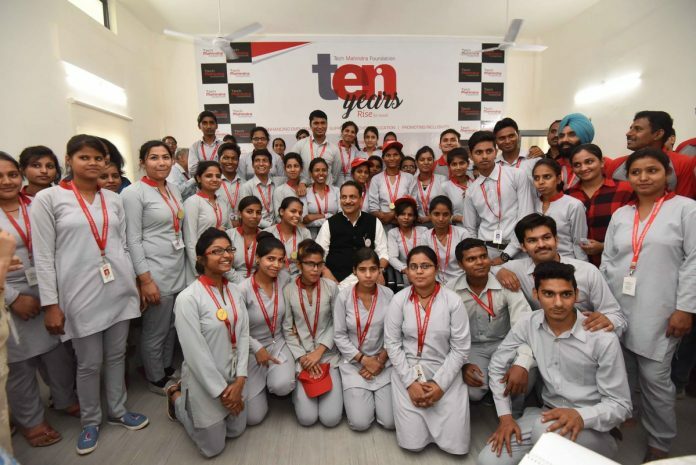 New Delhi: Rajiv Pratap Rudy, the Union Minister Skill Development and Entrepreneurship inaugurated a dialysis laboratory at the Tech Mahindra SMART Academy for Healthcare, Kingsway Camp, New Delhi. This inauguration coincided with celebrations marking 10 years and the establishment of 100 skilling centres of Tech Mahindra Foundation, the Corporate Social Responsibility arm of Tech Mahindra Ltd. Vineet Nayyar, Executive Vice Chairman of Tech Mahindra Ltd., Rajyalakshmi Rao, Director, Tech Mahindra Ltd,and Dr. Loveleen Kacker, CEO of Tech Mahindra Foundation were also present. The inauguration of the dialysis lab will pave the way for youth to be skilled as dialysis technicians. The minister also flagged off 80 new bicycles in the Last Mile Connect project, a Green Ride initiative to connect Metro stations with colleges through a public bicycle sharing system. This is a smart-card based system which allows students to pick up bicycles and use them free of charge to commute between the Vishwavidyalaya and GTB Nagar Metro Stations and the Delhi University campus. The Tech Mahindra SMART Academy for Healthcare works towards skilling low-income youth for careers in the healthcare sector by providing subsidised training courses. The Academy has been set up in collaboration with Harijan Sevak Sangh, an organisation established by Mahatma Gandhi in 1932 to provide skills to the underprivileged. Launched in 2016, the Academy has already trained youth as General Duty Assistants and the first batch of Operation Theatre Technicians will graduate later this year.